It may have seemed like an unlucky break at the time, but when researchers had to slice a Tyrannosaurus rex femur in half to get it out of the field, they found something completely unexpected. After some initial cleaning, paleobiologist Mary Schweitzer at North Carolina State University in Raleigh and her co-workers found that the T. rex bone still contained what looks like the original structure of blood vessels and other soft tissues. This is the first time that such tissues have been found so well-preserved. After finding a T. rex specimen at a remote field site in the Hell Creek Formation in Wyoming, members of a field team led by Jack Horner of the Museum of the Rockies at Montana State University in Bozeman encased it for removal by helicopter. But the piece was too heavy and had to be cut in two. Back in the lab, scientists recognized what they had and set the pieces of bone containing what looked like soft tissues aside for Schweitzer, who worked with Horner's team before moving to North Carolina last year. A newly published study compares T. rex blood vessels to those of an ostrich, one of the most primitive birds and most likely related to dinosaurs. 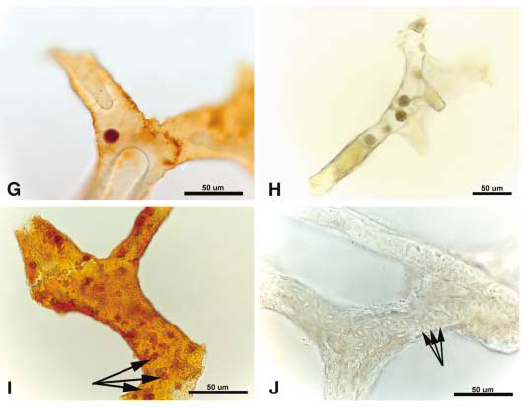 Mary Schweitzer and her co-workers isolated a fragment of a T. rex dinosaur blood vessel (G) that seems to retain its original microstructures; they compared it to a vessel (H) removed from an ostrich bone that still contains red blood cells, which has similar branching structure. 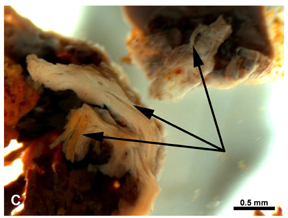 The T. rex vessel fragment (I) here shows cell nuclei (arrows) in the vessel wall, with detail of the branching pattern that looks similar to such nuclei and branching in an ostrich blood vessel (J). Courtesy of Science. "No preservative ever touched them," says Schweitzer, who took the bone samples to her laboratory in North Carolina and performed as many analyses on it as she could, including demineralizing the bone with weak acid to get to the preserved tissues inside and examining the pieces under a scanning electron microscope. "We had a three-week run where we just didn't sleep." Their analyses compared the structures to blood vessels in ostriches, which look stunningly similar (see images). "Ostriches are the most primitive of living birds, and probably have more in common with dinosaurs than with robins," Schweitzer says. For now, she says she needs more equipment to look more carefully at the structures before anything can be said for certain about what they are composed of. Images published in the March 25 issue of Science show tiny "dots" that could have been blood cells, or some other structure, among other interesting visible characteristics. The tissues also remain surprisingly flexible. "They sure look like cells and soft tissue matrix," Schweitzer says. "It's hard to imagine mineral replication that is flexible and still transparent." "There's a subtle gradation in the way you can preserve fossils," says Matt Carrano, curator of Dinosauria at the Smithsonian National Museum of Natural History. Typically, minerals completely replace all the "original" materials or structures in a dead animal, in order to create a fossil, retaining only the shape; even soft tissue preservation tends to be limited to skin impressions or other such secondary forms. Carrano says that most of the remains are fossilized, making it a very strong physical structure. "It's an ideal situation," he says. "You've got almost a sealed outer shell," protecting the "naturally occurring spaces in the bone. Those spaces are largely not open to the environment," and anything that would degrade the original components could have been blocked out. "In my personal opinion, I would not be surprised if they find original material in there," he says, though only very small amounts. The arrows here point to regions of the demineralized T. rex bone that look fibrous. Courtesy of Science. The astonishing findings also have fueled discussion on whether DNA fragments or even protein may have survived intact during their 70-million-year entombment. The possibility has raised references to Jurassic Park in the press, but for now, it is pure speculation as to whether such microstructures remain intact in the T. rex fossil. "Nobody thinks this is possible, including me," Schweitzer says, and "we have to be extra, extra careful about it," when determining whether the structures are original or not. If they exist in the sample, DNA fragments or proteins could give amazingly detailed information on the genetic code of T. rex or details of their metabolism, and the possible answer to the warm-blooded/cold-blooded debate. Derek Briggs, a paleobiologist at Yale University and an expert on fossilization, says that most likely the team will find "not much more than traces of protein, if indeed they've even got protein," and that no DNA could survive that long. Routine archaeological investigations can analyze DNA up to about 100,000 years old, but before that time break, other work has shown it to be "so fragmented it's totally worthless." Briggs says that the preservation itself is "extraordinary" and "undoubtedly a very spectacular discovery." The "rigorous" comparative work the team reports in supplementary material supporting the Science publication shows that other fossils may contain similarly preserved soft tissues. Still, how the tissues were saved remains unknown. Briggs and others have shown that the molecules of the original material itself, such as carapaces of beetles trapped in amber, might "recombine to form what we could loosely call polymers," he says, that are more stable, less likely to be broken down, and still form flexible chains of carbons. It is possible that the molecules inside the T. rex's bone "survived long enough to start that process," which is "astonishing," Briggs says. "There is little doubt this kind of preservation may be far more widely spread," he says, and if it happens in a variety of settings in different bones, scientists could "potentially add soft tissue information to the range of characters" they use to sort out how organisms are related. Scientists connect different dinosaurs, for example, by their hard structures only. But "more simply," he says, such preservation "may tell us something about [an organism's] physiology"  the very basics of how a body works.